"Got our motor running, heading on the highway, looking for adventure, and whatever comes our way"... The Cult classic captures such a great feeling. After 16 months of somewhat structured travel itineraries (minus the unexpected Prize or Cruise), we have taken off the auto pilot and just seeing where and who the road leads us to. It is still Jan-Feb here in Spain and it can be cold, so we think the coast road (Costa Blanca) will be warmer. After a 3 day visit to Valencia, (a really beautiful city), we eat some iconic Paella, wash the few clothes we own, and off we go. We sometimes drive an hour, sometimes 3 hours. Each night we ask, "Do we stay or do we go? "...Usually it is go, and hopeful to discover/meet the next cool thing. We were not "Born to Be Wild", but we were Born to Travel. Andrew (middle) is inspirational, a person who will someday have a book/movie made about him. After several near death experiences and overcoming severe health issues, Andrew has the zeal and belief of Apostle Paul taking on the Greeks. A person we will be seeing more of in the years to come. The other gentleman is Hero, the owner of the wonderful "Restaurante Hero"where we are dining in Els Poblets, Alicante. ...We find beautiful fruits and vegetables - and giant radishes!!! A clever and tasty way to eat fresh sardines...hmmmmm! White Spanish Vermouth, Red Spanish Vermouth, Rum, Red Wine, Fanta orange and lemon soda, sugar, and let's not forget the cut up fruit.....We were very happy the rest of the day! 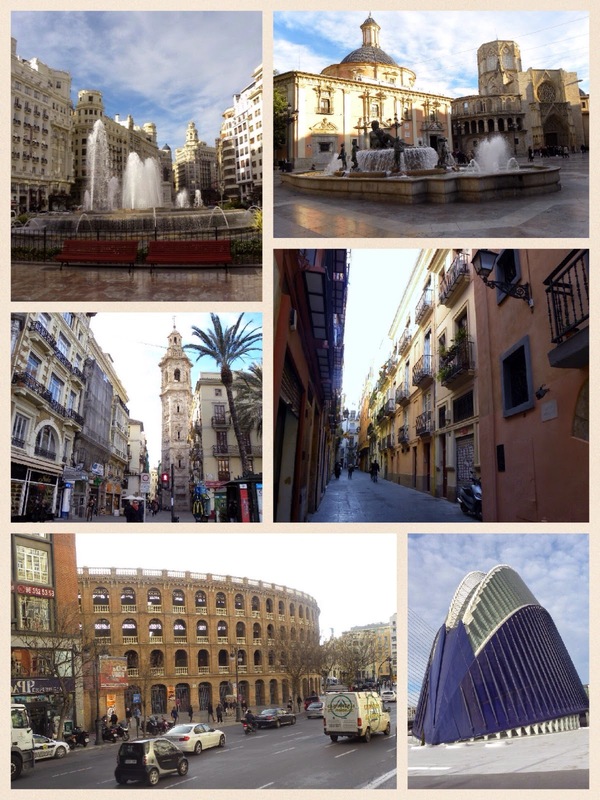 Valencia was founded as a Roman Colony in 138 BC. Today even the Old City has been restored to look new...walking aimlessly and taking buses through the city, you experience so many styles of architecture from Romanesque to Moderniste. 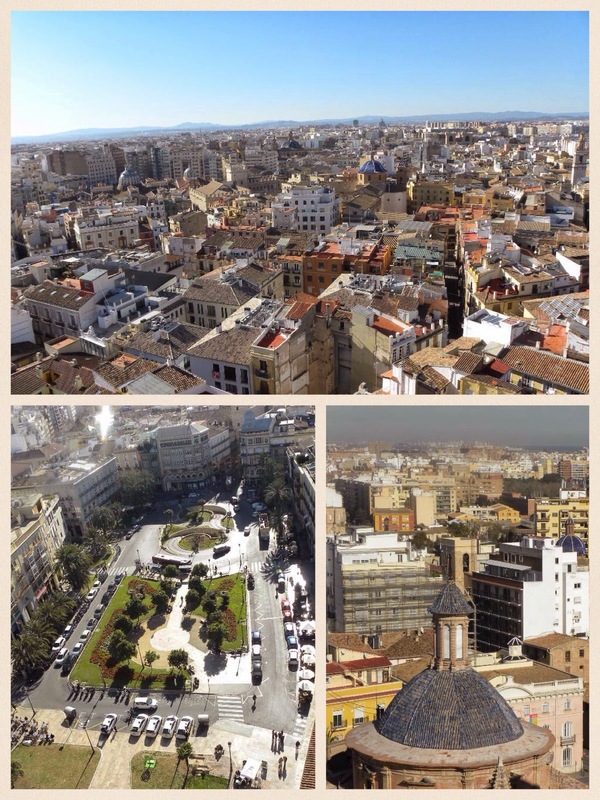 For a large city, Valencia is clean and vibrant. ...Interesting note on another "not so pretty sight", While driving through Almeria - there must have been miles and miles of plastic green houses all along the road...I guess it's a way to grow food in the driest places of Spain. I had to Google this to find out more - you can do the same, I won't bore you with what I learned. The Cartagena Roman Theater dates from the 5 -1 Century BC, but was not discovered until the late 1980's underneath poor and deteriorated housing built over it. 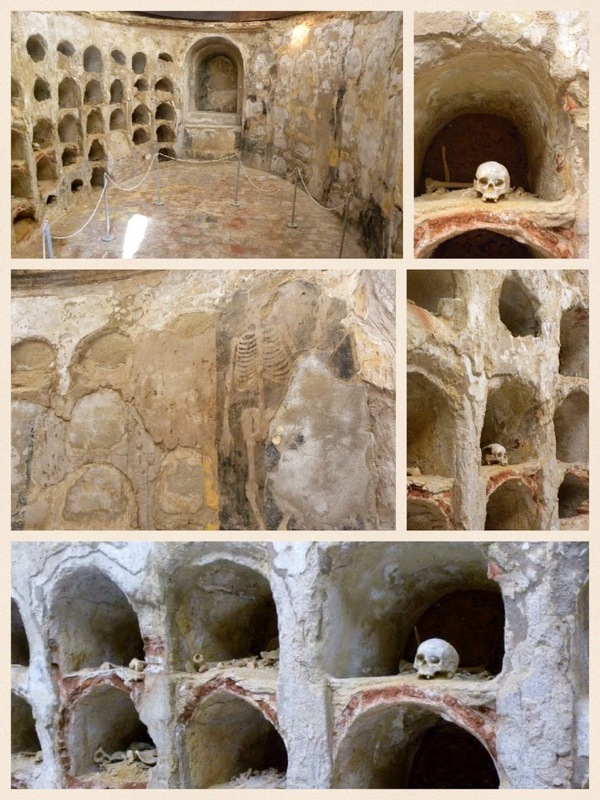 The Roman Theater Museum is a must see! The 3 days we spent in Cartagena we walked and walked (what else is new, we still have Christmas and Cruise weight that must come off)... and there are wonderful statues scattered all over. 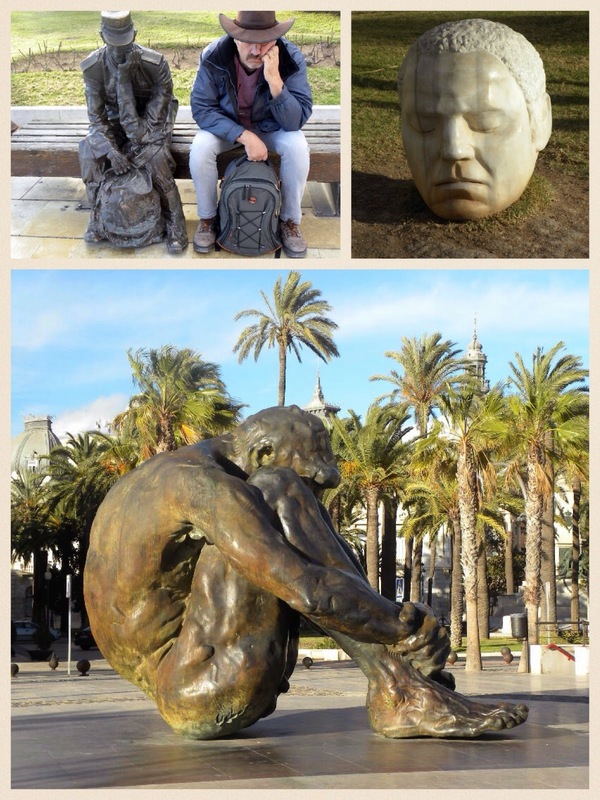 Bottom is "El Zulo", a heart wrenching (2 ton) bronze statue dedicated to the victims of the 3/11 terrorist attack in Madrid, 2004. We always take a coffee break in the afternoons, the owner of the Cafeteria Restaurante Teatromano located in the town square told us we must have an "Asiatico" coffee. It is known only in Cartagena!... 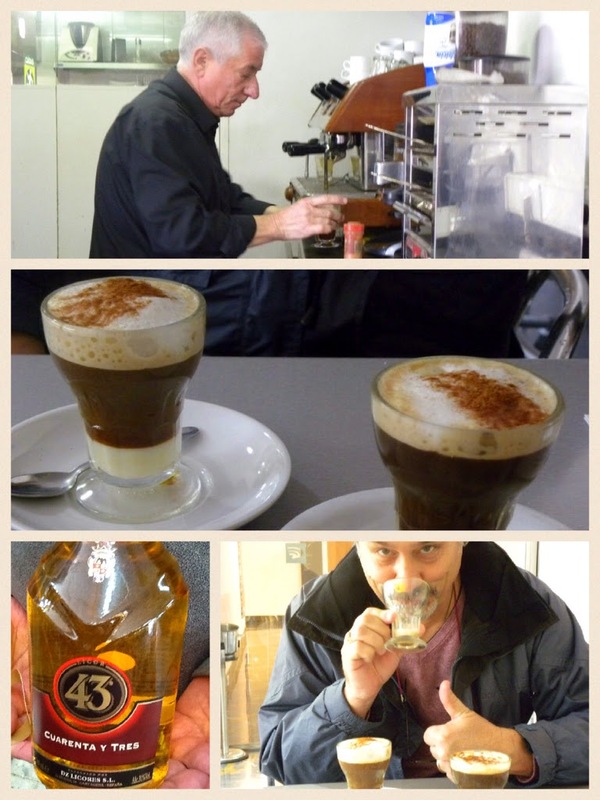 Of course we loved it - and asked for a 2nd cup and the recipe.....No wonder why we loved it, little did we know it was the Licor 43 made in Cartagena that made it so special! Simple recipe I must put down here just so I remember: Shot of expresso, Licor 43, Conac, condensed milk, Lemon and orange twist, cinnamon, and cream. This was indeed a treat and made walking the city much easier! Nerja is a beautiful town 3 hours south of Cartagena. Nerja is famous for its prehistoric caves and caverns - where Stalactites meet Stalagmites. 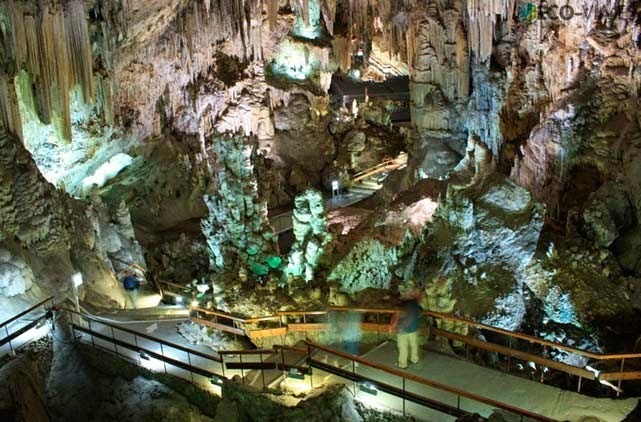 The beautiful "Speleothems" are jaw dropping and the vast and extensive caverns have a "Do Not Miss" label. No photos (especially mine) or postcards we saw could do it justice.